I had to miss Act III, but listened to it this morning and remain entirely overwhelmed by the experience. Hans Peter Konig thrilled me as Hagan, his "Hei ho" bit having nearly the same snappy, snarl and oily blackness of Matti Salminen who (for me) remains the greatest interpreter of the role in my experience. Just marvelous. I really (really) liked Jay Hunter Morris, but still feel he was nearly "too pooped to pop" in Act III, and yet his intensity and natural feel for the role won me over. 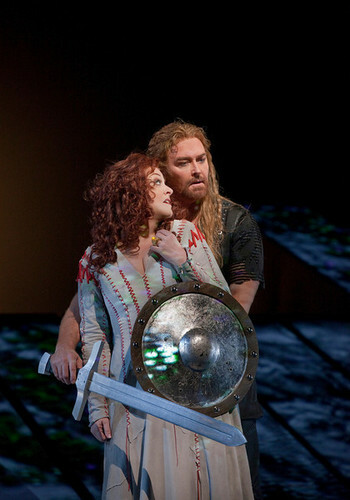 I get a sense he will learn to better pace his Siegfried and be terrific in the role in the future. I really hope I'm right! Debbie . . . Debbie had me in tears during the Immolation Scene. Maybe it's lack of sleep on my part, but I was electrified throughout and, while, at several moments, I may have wished for more of a way with the words (though very few moments, actually), and a less curdly-note here and there,Voigt's feel of the role overwhelmed me. Magnificent. I think she shocked the pants off rather a lot of naysayers and predictors of doom. Brava, Madam Voigt, brava! Maestro Luisi's handling of the entire act (and the entire evening) was propulsive in a way that recalled, for me, Boulez in Bayreuth. While some may complain about the "excessive" speed of the final 20 or so minutes, I found this to be one of the most riveting, thrilling (jaw dropping, in fact) finales in my entire "Ring" experience. Wagner's amazing score truly SOUNDED like water with the aural equivalent of waves and swirls, rapids and falls violently tumbling across the earth. It was shaped so perfectly I am still sitting here, entirely amazed, but the opposite of numb. Before anyone takes sniper shots at me and labels me a heathen, idiot (or worse), let me answer: YES, I've heard, and am a fan of, Furtwangler, Knappertsbusch, Böhm, et al., but this was a unique, wonderful (modern?) reading (despite some blemishes from the band I expect will smooth themselves out over time) that held me as if spellbound. By the end, I was completely overwhelmed and loved hearing the audience response and the nearly deafening ovations. That made the horrible booing for LePage and Co., all the more horrifying. I really didn't expect it and could not believe the bloodlust of the booing. That it continued straight through,through the rest of the ovation (save the final individual bows - but returned) made me a bit sick. While it may have failed to live up to the expectation and hype, could this have been THAT horrible a production to deserve such a violent interruption to an otherwise emotionally satisfying evening? All I could think, was, "what ill-bred monsters these booers be". I must say, listening to it over the airwaves (ether?) I was startled Margaret and Will didn't mention the booing during their post-performance narrative. to that ol' devil, Wagner! I think the world of Fabulous Luisi from everything I have heard him do, including the Ring in the house. I remember hearing a live recording of a second rank Italian opera from the Vienna State Opera severa years ago before he was known here, and thinking "This guy's great and is going somewhere." There are so many Rings but the Bohm/Bayreuth and Krauss/Bayreuth are probably my favorites. I'm sure this is just me, but I cannot abide Knappertsbusch, particularly on those days when he really couldn't care less. That was a great show, ay? I caught the HD broadcast and it was the shortest 5 hrs show I ever sat through! :oD I actually liked the staging with La Machina.. it doesn't distract too much from the acting singers (well, at least things didn't look too hazardous in this opera anyhow... and nobody fell off the planks). 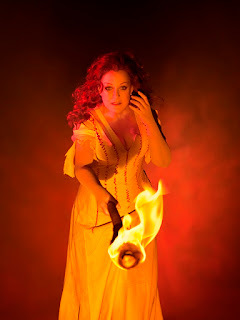 Debbie Voigt really came through, though I'm a bit concerned about her doing all the Bruennhilde back to back in the complete cycle next season. I thought she was severely tested in Walkuere but had just enough voice for Goetterdaemmerung (I missed the Siegfried broadcast). But that Hans Peter Koenig was really amazing! Practically stole the show. :oD I'm not a big Wagner fan but the Met does get the best cast for the cycle money can pay for, ay? Netrebko as Anna: Can no one really touch her? The Little Red Dress . . .